Kaspersky is one of the leading and best antivirus software in this industry which has gained high scores on various independent tests to measure protection and performance of these antivirus software. It proved its excellence when it comes to detecting, blocking and removing various internet threats. Kaspersky recently unveiled its 2017 version of antivirus software which is compatible with Windows 10. When it comes to testing by independent laboratory AV-Test, it performed significantly well while using its 2016 version. Its performance was above expectations, and its extra security features make it a perfect fit for your quest to get to best antivirus software. Talking about scores for protection along with usability, Kaspersky performed well. This software is quite a handy tool to identify newly emerging threats along with existing ones, and it blocked these threats quite effectively. Although, it may slow down you PC slightly, still you won’t feel any performance issue with your PC. It accurately differentiates between malicious and safe files. Even though it is an entry-level antivirus software, it consists of various features than its competing products. It also provides real-time security against malware and also secures your any online financial tasks and transactions. In case it encounters any new threat, it sends the data regarding it to Kaspersky Lab. It provides one of the support structure in this industry. It gives email, telephonic and live chat support which is available 24/7. It also has its own forums, FAQs section along with videos to assist you in case you are stuck with some problem. 1. 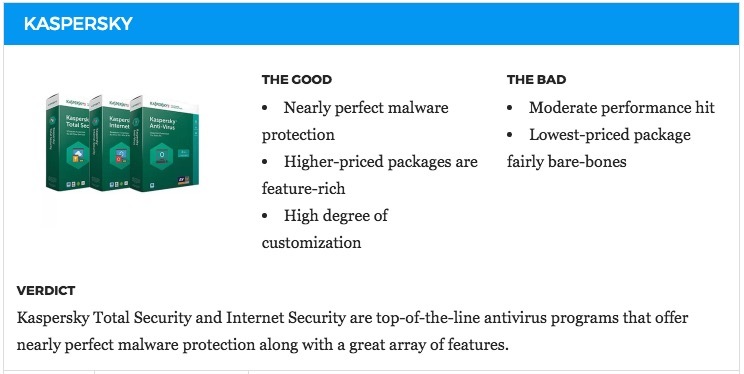 Kaspersky Antivirus has some of the best features compared to its competitors. With great virus protection, it also provides antiphishing services. It scans your emails and instant messages to ensure that your system doesn’t get infected. 2. It also scans the USB drives automatically which also adds another layer of your system protection. 3. It also has a gaming mode, which makes sure that this software doesn’t slow down your videos and games. 4. It isolates the various threats and removes it even if your system gets infected with a virus. It recovers your system automatically from any sort of damage that was caused by any threat. 1. Even with its great features and positive points, when it was used for testing purposes, it didn’t score significantly well. Kaspersky Antivirus is one of the finest antivirus software available in the market. Its excellent protection against malware along with phishing attacks makes it a good choice. It not only tracks down and resolve various threat but also provide the ability to recover from the damage caused by any threats. With this, we end our reviews of Kaspersky Antivirus. In case you opt for this antivirus, then do let us know your experience with it. Do tell us your views and suggestions on this product or on the industry in the comment section below.